The Ladrillos Shelving System Costs An Arm And Half A Leg | OhGizmo! By David Ponce on 03/20/06 • Leave a comment! 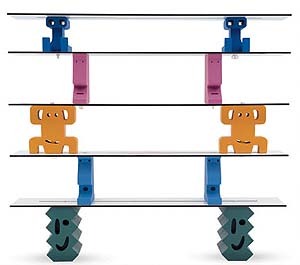 If you’re looking to make yourself some shelves, and are after that Space Invaders, 1980’s arcade shooter type of look, then perhaps you’d be interested in the Ladrillos Shelving System, by one Javier Mariscal. “Ladrillos” means “bricks” in Spanish, and I’m thinking that these bricks better be made out of magical space stones to justify the outrageous price tag. Get this. The entire “system”, consisting of 5 white shelves and 2 supports in each color: dark green, green, pink, orange, yellow, light blue, fuchsia, and blue (so 16 bricks) costs $2,820. Should you want to add a set of two more shelves, you’d be out another $716. Yeah, I think I’ll just look at them from afar, and say “How purdy!”, and walk away.